With 4th of July coming up I have lots of things on my mind- sparklers, fireworks, cookouts, red, white & blue outfits. And sadly- allergies. Justin and I both suffer from seasonal allergies as well skin sensitivities and while we love entertaining outdoors I always try to be mindful of ways to keep our allergies at bay. 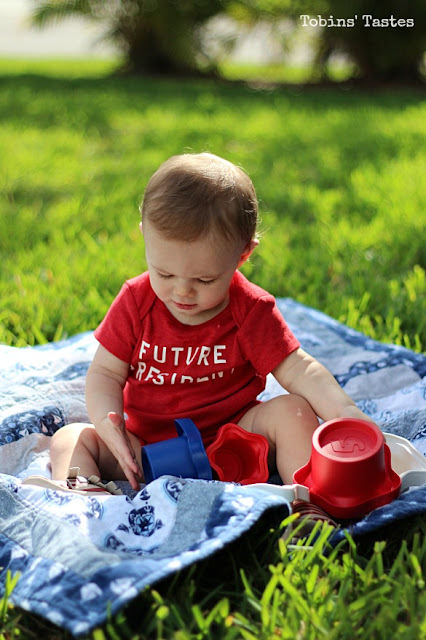 Now that we have Easton, I am even more conscious of making sure all of our clothes, blankets and towels are washed in laundry products that are free of dyes, perfumes, certain chemicals, and irritating residues. And while I don't know if he has any allergies yet, I love knowing that we can snuggle Easton without being worried that he will have a reaction to our detergent. 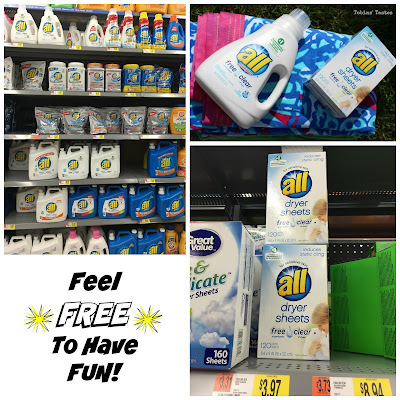 When I decided to host a little get together for my girlfriends and our kids I knew that I would need to make sure that all the towels and blankets were washed in all® free clear detergent so that everyone could enjoy the day allergy free. All® free clear detergent is the #1 detergent recommended by dermatologists, allergists, and pediatricians for sensitive skin. 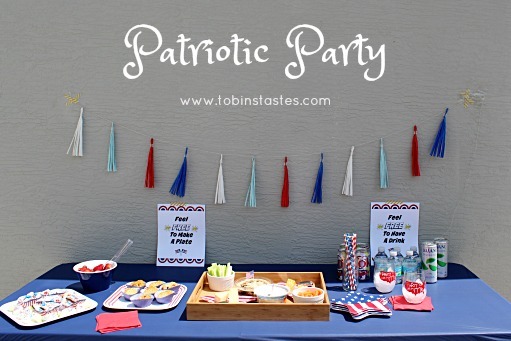 Since it is almost 4th of July I figured that a little patriotic afternoon party would be the perfect way to get the kids together and tire them out before nap time. I filled up the baby pool, put together a little tray of chalk and bubbles and made some snacks for both the moms and the kids. 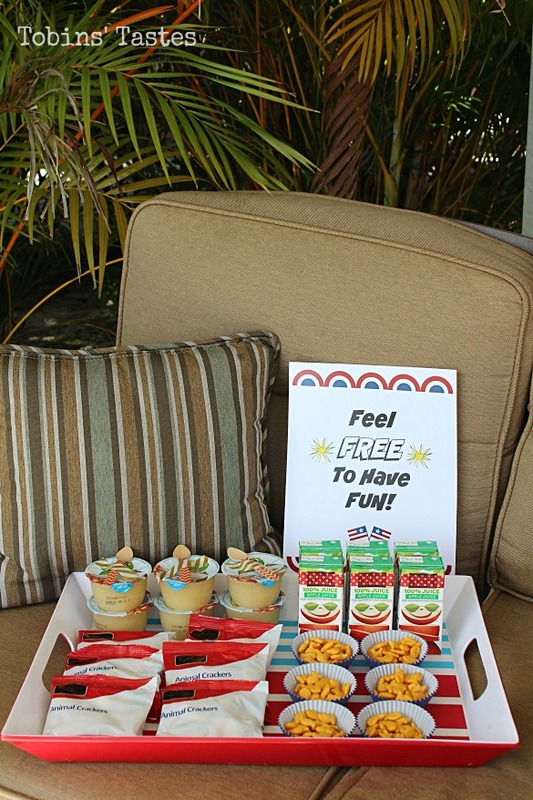 Whenever we are entertaining outside I like to keep things as simple as possible. I try to make as many things single serving as I can to cut down on the need for people to have to serve themselves. No one wants to put their bubble covered hands into the chip basket. I filled cupcake liners with crackers, pretzel chips, and goldfish for the kids so that people could just grab a single portion and go. 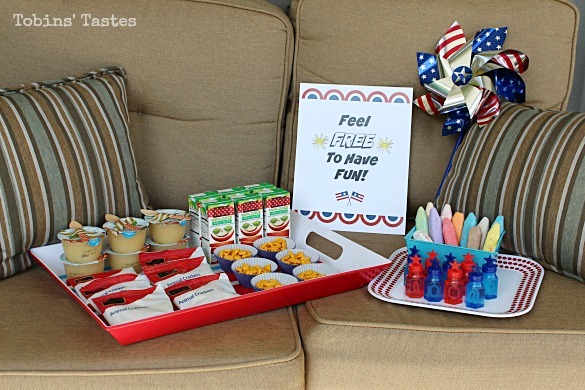 I put all of the kids' snacks on a separate tray and kept it on a bench so that the kids could reach their own snacks. 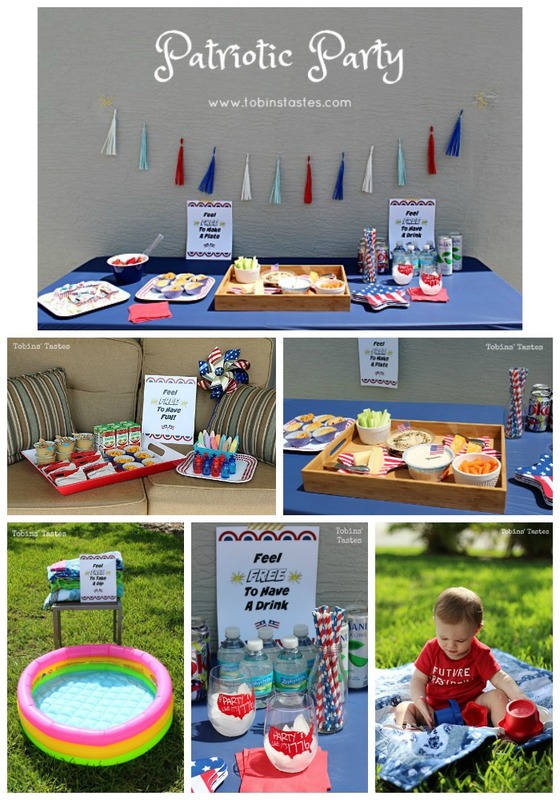 I also put together a little tray of chalk and bubbles too so that all the things they would need would be right in one place. For the moms I put out some hummus, greek yogurt dip, cheese and crackers. 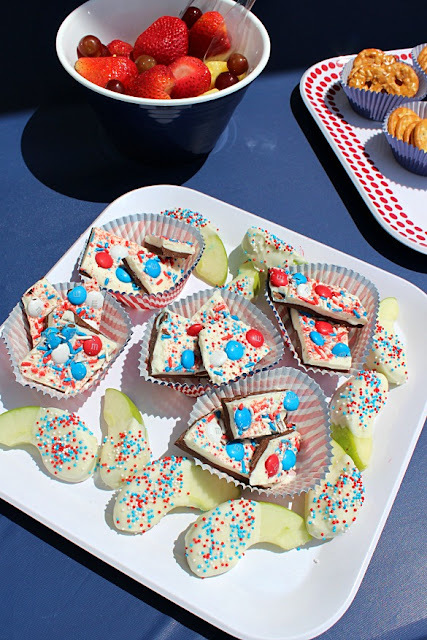 I also served fruit, white chocolate covered apples and Fireworks M&M Bark for dessert. I made the desserts single serving as well for ease of eating. 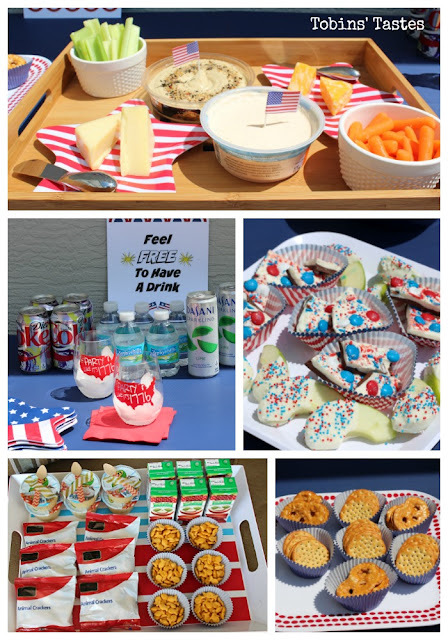 A few cold drinks and my spread was complete. Everything was either store bought or easy to make ahead which made my life a lot easier on the day of. The single servings made for a simple clean up too. 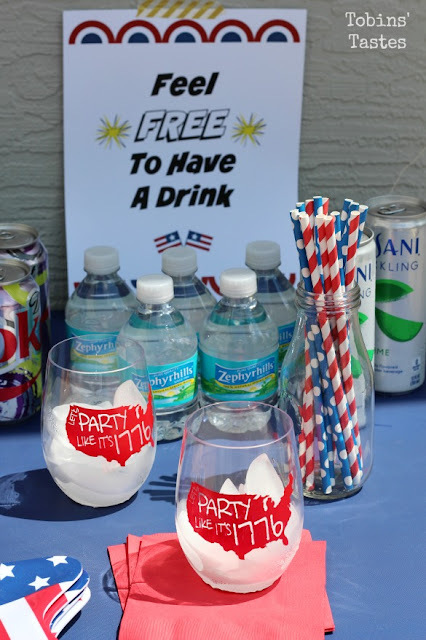 I tend to buy my party decor through out the year when I see things that match a theme or holiday I know I will throw a party for. Most of the serving ware I already owned and I picked up my cupcake liners and table cloth at Walmart. The table cloth was a new type that I had never seen and I fell in love with it. It is basically like a fitted sheet and snaps onto the top of the table. It was amazing and never needed to be readjusted. I will definitely be stockpiling these for the future. I created my signs using PicMonkey (basic version is free!). I printed mine on card stock so that they would be a little more durable for the outdoors. Below are the printable versions of the signs seen in the post. The last one is blank so you can add your own text if you like. If you open the blank one you can use the font "Smash" to add your own words or text. To edit, simply save the last sign below and go to PicMonkey and open the image from your computer. Follow the steps above to open the "Add Text" tab. 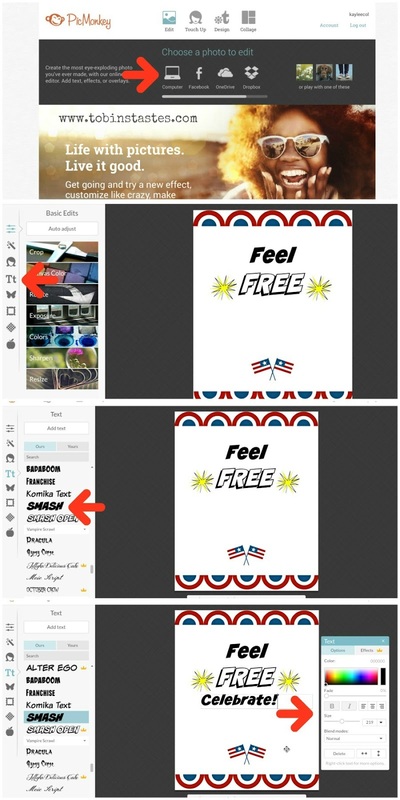 Select the font "Smash" and click "add text". Then use the text box that opens to add your own words and size them how you like. Save the image and then you can print how you like. While all® free clear detergent is not intended to treat or prevent allergies it does help remove allergens, including cat and dog dander, dust mite matter, ragweed, grass, and tree pollen. That makes it a perfect laundry detergent for helping with year round allergies. Be sure to always follow the directions on the packaging exactly, especially with little kids in the house. 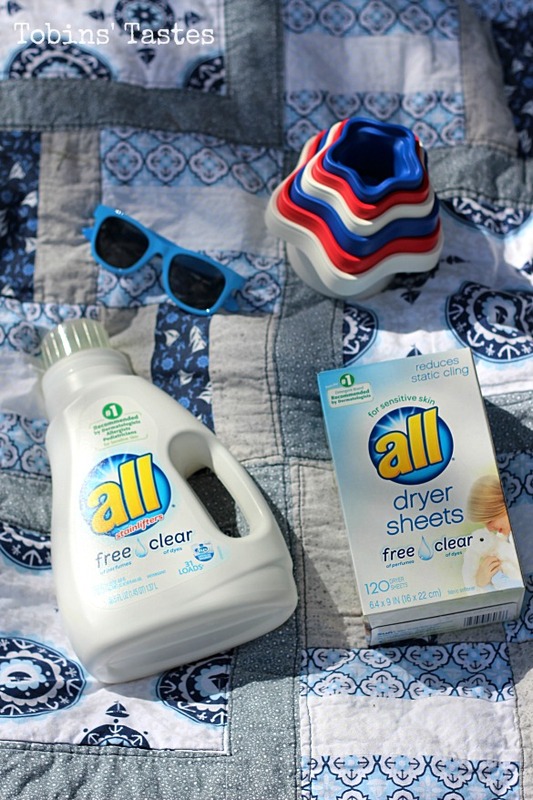 I was also thrilled to find the all® free clear dryer sheets at my local Walmart since I have been looking for something to use with Easton's blankets and towels. 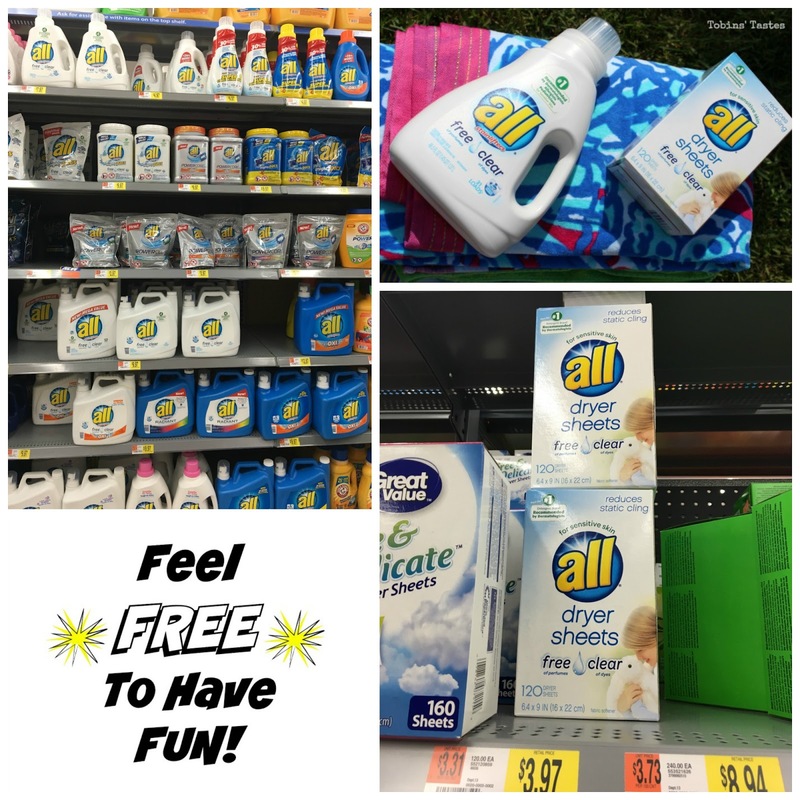 Want to learn more about all® free clear detergent and connect with other parents and families? Check out the all® free clear community! Justin and I consider ourselves Disney World veterans. We have annual passes and thanks to a combination of the passes, having friends in the area with passes and attending a 4 day blog conference at Disney, we spent over 20 days in the parks in 2015. And I was pregnant for 9 months of it. 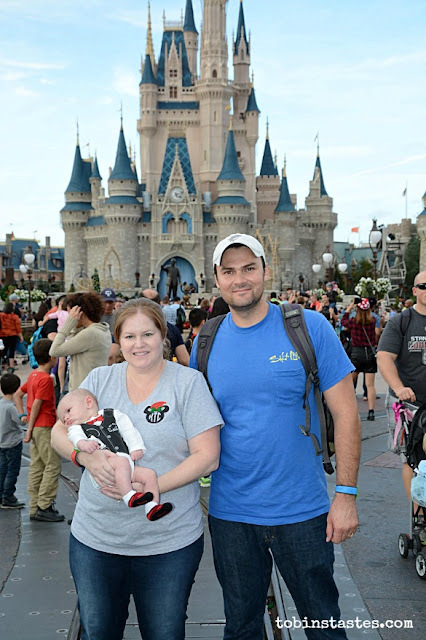 So we have learned quite a few tips and tricks to navigating the parks and as we prepared to take Easton for the first time I tried to use what we already knew to make our first trip with him as smooth as possible. 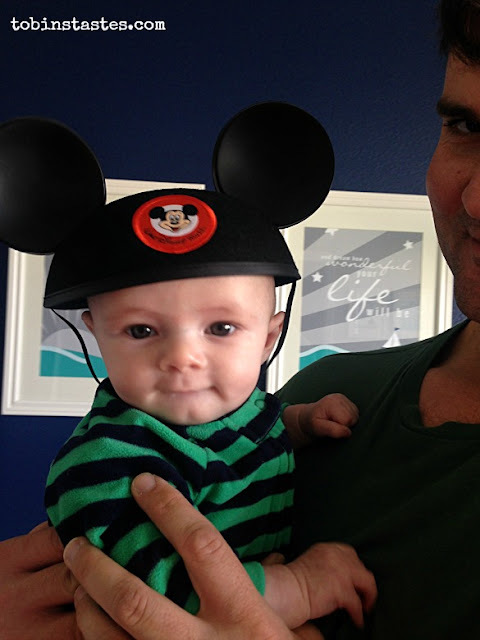 Some people might think we are crazy (and I include my mother in some people) but Justin and I took Easton on his first Disney World visit before he was 8 weeks old. It was just a quick trip to Epcot but since then he has been 6+ times and every time we learn something new about taking an infant to Disney. There are a lot of great articles out there on bringing a baby to Disney but most of them focus on bringing a baby on a week long trip and what to pack, how to travel and so on. 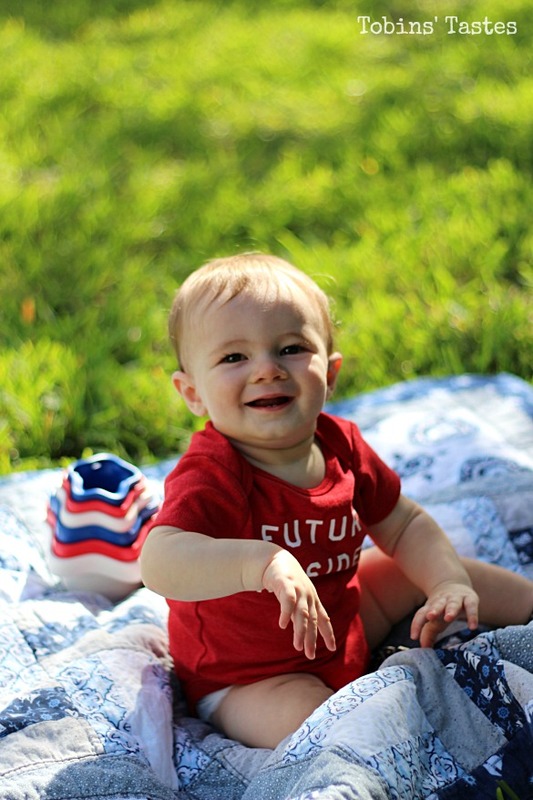 While many of those tips also apply to a day in parks, I wanted to focus on the actual logistics of spending a day in the parks with a baby. Here's what we've learned so far. 1. Be prepared, but don't pack to much. Before Easton was born Justin and I could spend 12 hours in a park with nothing but a small backpack. The first time we took Easton I packed like we were going out of the country for a week- 20 diapers, 5 outfits, my pump. We looked like crazy people walking around Epcot. While it's definitely good to throw in a few extra outfits,bottles and pacifiers, don't forget that not only does Disney sell baby products in it's Baby Centers but all the resort gift shops sell things as well. You may end up having to pay Disney prices but in a pinch you'll probably be able to find what you need. 2. Take advantage of the Baby Centers. The best thing about bringing a baby to Disney is that unlike a lot of public places, all four Disney parks have designated Baby Centers. These are air conditioned places completely set up for taking care of infants and younger kids. They have changing tables, nursing rooms, places to pump, clean bathrooms for little ones, places to feed babies with a sink and microwave and even an area where older kids can cool off and watch a movie. They are fully staffed and sell things like diapers, wipes, food, formula and even extra clothes. The prices are what you would expect for being inside a theme park but its a great back up. Animal Kingdom's is the newest and our favorite. Magic Kingdom's seems to be the busiest. Epcot's is huge and seldom used and Hollywood Studio's is super tiny but does have private nursing areas. 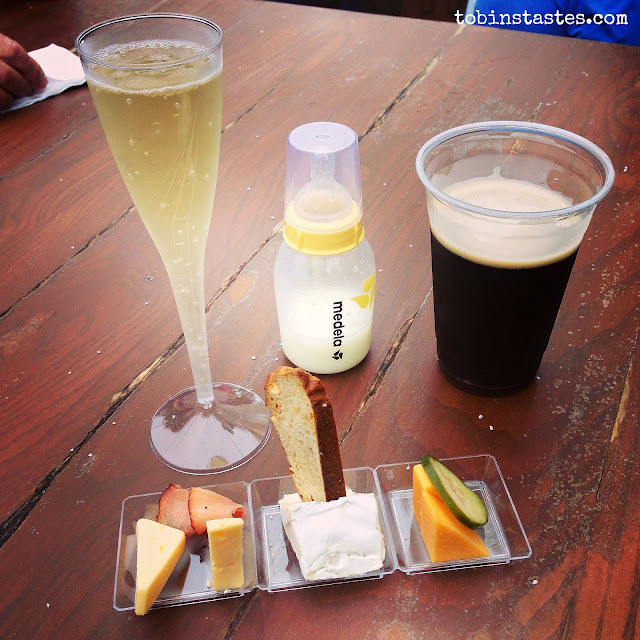 While you are allowed to nurse anywhere in Disney and all bathrooms have changing tables, we like to take advantage of these if feasible especially when Easton was really young. Another tip- if you are bringing your pump with you, you can check it at first aid which is right next to the Baby Center. They won't store milk for you so you will need to bring a cooler pack to carry it around it but it's very nice not to have to cart your pump around too. Comprehensive review of the Baby Centers coming soon in a separate post. 3. Don't make advanced dining reservations (ADR's). This one goes against everything you hear about planning for Disney but with a baby ADR's just aren't always feasible. Before Easton, Justin and I would plan out our Disney dining way in advance. We were known to book hard to get reservations and then make a trip around them months later. 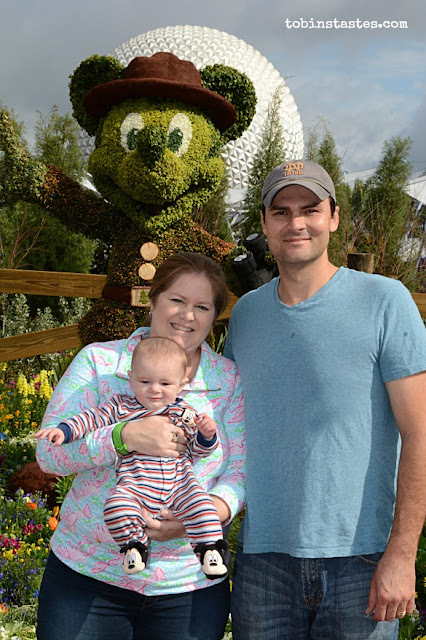 However, as many people may know, Disney charges $10 a person for reservations that are missed or cancelled day of and with the unpredictability of doing anything with a baby, we stay away from them when Easton is with us. While this has meant that we may not get to take him to Be Our Guest or California Grill (not like we would take him there anyway) we still get to eat at a lot of great places. Places like Sanaa, The Wave, Skippers Canteen and many Disney Springs restaurants will take walk ups or you can try out new counter service restaurants. We also love making a meal out of snacks or sitting in the lounge of a restaurant as most serve the same menu as the sit down portion and are usually quieter. Sometimes we will even make a reservation morning of once we are already on our way to the parks but even then we build in a lot of extra time in case Easton has a melt down or diaper blow out on the way. 4. Bring your own stroller. I know this one may be difficult if you are traveling but when Easton was an infant it was so nice to have his stroller with his infant seat attached. That way he was safe and comfortable and he could sleep whenever he wanted. We use the City Mini and love how he could be completely covered up so that he could sleep or just be kept away from strangers trying to touch him. Also, if you have a commonly owned stroller, you may want to attach something to it to distinguish it so you can find it easily in the rows of parked strollers outside rides. Once he is a little older we will transition to a more compact umbrella style stroller but for now, his big stroller works perfectly. Just keep in mind that if you are using bus or tram transportation you will have to fold up your stroller completely (and remove the carrier part if you use one). The monorail and the Magic Kingdom ferry let you take the full stroller on though. 5. Bring a baby carrier. 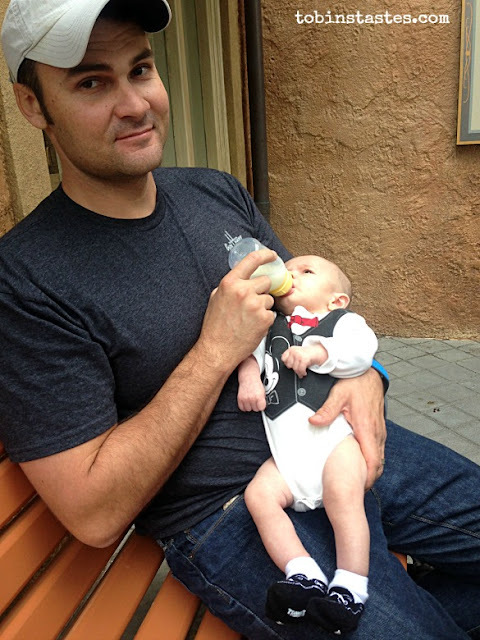 Even though we bring Easton's stroller, we also bring our Tula baby carrier as well. Most rides won't let you bring the stroller in line so the carrier is great to have on hand. We also like to keep him in the carrier during fireworks and parades as it is very crowded/loud and we just feel safer having him in the carrier instead of the stroller. Waiting in line with a baby is something no one wants to do. Make sure to schedule your Fastpasses for rides baby can go on so that you can essentially walk right on. Be sure to space them far enough apart to give yourself time in case you need to stop and feed/change the baby and account for walking with a stroller. Although they seem to be phasing them out in some parks, we love using Fastpasses for parades and fireworks with Easton because we like knowing we have a safe, reserved area to watch from without all the jostling and crowds of regular viewing areas. 7. Enjoy things you didn't take the time to when you came without kids. Some of our favorite memories so far in the parks with Easton are doing things we didn't normally take the time to do before we had him. We would usually be hopping from thrill ride to thrill ride or spending time in our favorite restaurants and bars. Checking out the World Showcase Pavilions, shows like the Hall of Presidents, listening to musicians or strolling the animal paths at Animal Kingdom are all baby friendly and things we didn't always slow down and enjoy before hand. Also the visiting the resorts, the Boardwalk and Disney Springs are all low key activities that are perfect for any age. 8. Go early (or stay late). If your baby is an early riser, head to the parks when they open. The weather will be cooler, the crowds will be lower and you might be able to get a lot done before nap time. 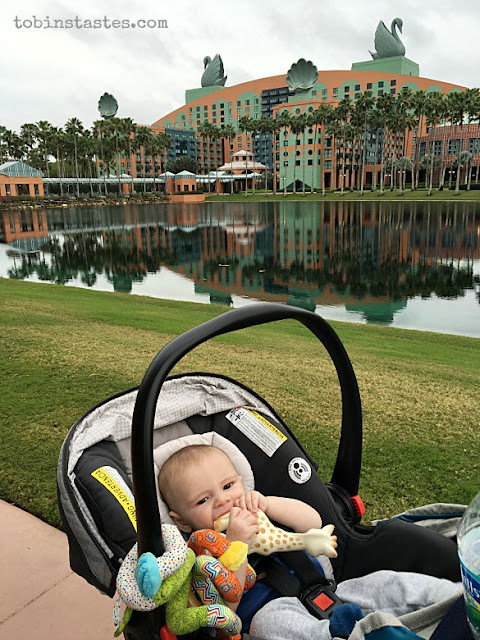 Easton has always been happy to nap in his stroller at Disney but if your baby prefers a crib/pack and play you can always head back to the hotel during the busiest/hottest part of the day for a nap. 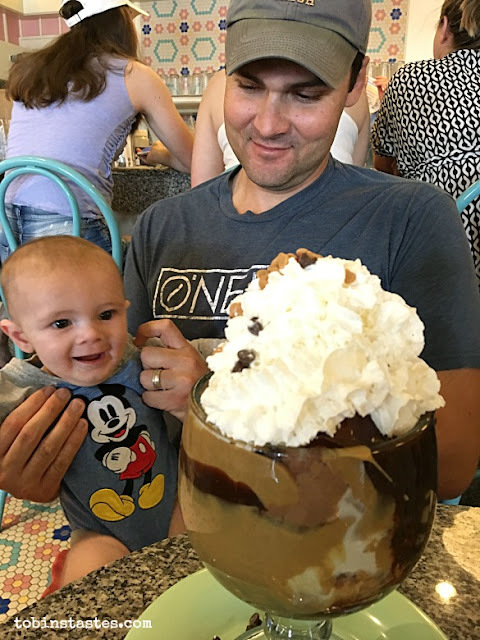 Since Easton didn't mind sleeping in his stroller we would sometimes go to a late lunch or early dinner at the Wave and then walk to Magic Kingdom from there. Peak hours in the parks are always the busiest and trying to navigate a stroller through crazy crowds made both Justin and I anxious so we avoid it if at all possible. 9. Have a plan, but be flexible. 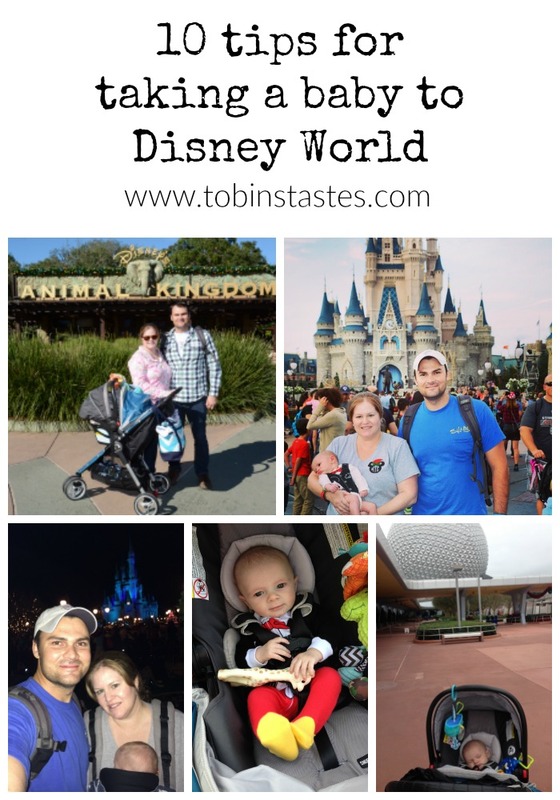 This one goes for Disney with or without a baby but it is essential to have a plan for the park when you have an infant joining you. Check out a map of the park before you. Have an idea of where/when you want to eat. Download the My Disney Experience app so you can check wait times in real time. You'll only waste time and/or want to kill your spouse if you walk into a park with no idea of what to do or where to go. That said, plan on needing to be flexible too since babies don't care if you have a noon fastpass+ for Jungle Cruise or that you wanted an afternoon Dole Whip. The great thing about the MDE app is you can adjust your fastpasses as you go depending on availability. Also remember that you can usually show up 15 minutes late to a dining reservation without penalty as well. Recently Justin and I had a baby free day at Disney thanks to our amazing mothers. We managed to visit all four parks, have lunch at Be Our Guest, dinner and drinks around the World Showcase and ride almost every roller coaster/thrill ride on property. These types of days were typical before we had an infant tagging along. We have had to do some major adjusting of our expectations now that we have a baby. You may not get to ride every roller coaster. Getting from one park to another will probably take ten times longer than they did before. You may not make it until fireworks. I'm guessing you may not be enjoying a romantic dinner at Le Cellier. And that's ok. You can still have an amazing time at Disney even with an 8 week old. Just be ready for people to tell you that you're crazy- your mom included. 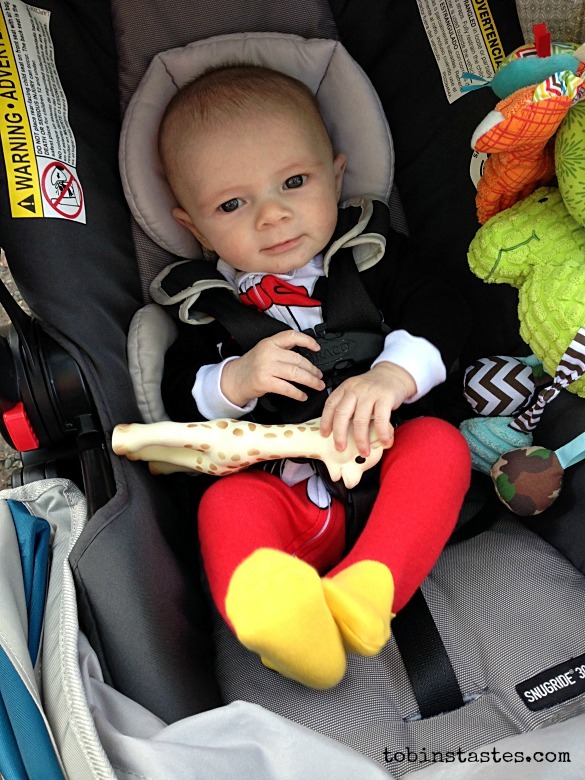 Have you been to Disney with an infant or little ones? What are your suggestions to first timers? 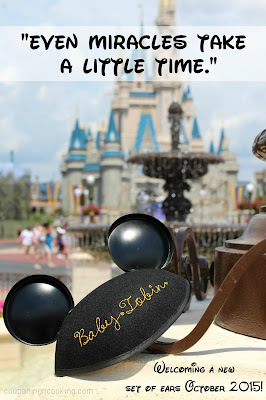 Check out our Disney Baby Announcement! Looking for Disney outfit inspiration? 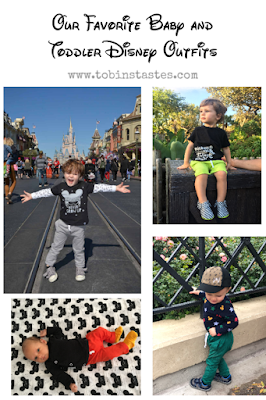 Check out our newest Disney Style post! Summertime means lots of things in our household. It means warmer weather, longer days and lots of time with family relaxing outside. As a teacher, summer also means I finally have the time to try all those recipes I keep telling myself I'll get around to. My brother is in town from Chicago this week and since we were having family over for dinner and dessert I decided to try my hand at two things I have wanted to make for months- homemade caramel sauce and honey comb candy. I know those two things don't go together at first glance but the combo comes from a Food Network show I saw about an ice cream shop in Brooklyn who makes ice cream with both mixed in. Now I may have more time to experiment in kitchen now that school is out but I also have a seven month old so I decided to keep my expectations reasonable and skip making homemade ice cream for now. 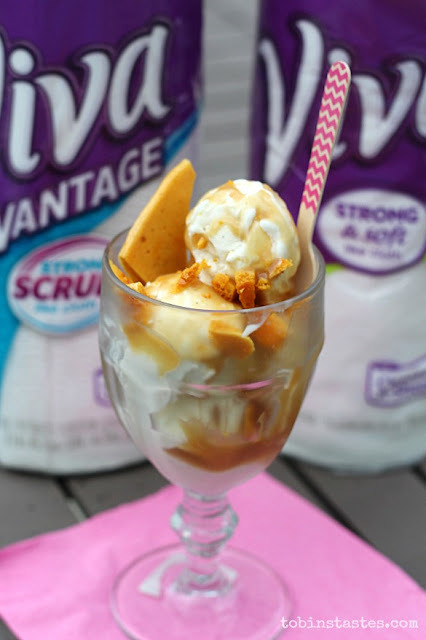 I picked out some delicious looking store bought ice cream at Publix while shopping for my recipe ingredients and I grabbed a few rolls of Viva paper towels too because caramel is the type of recipe you can guarantee will be messy. 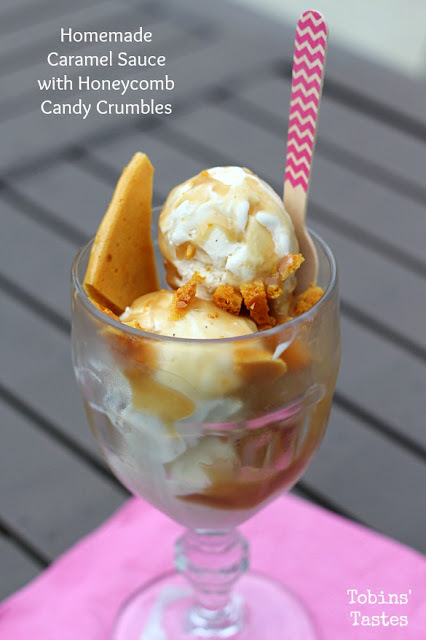 The caramel sauce and honeycomb candy turned out better than I hoped and I loved that they were both easy to make earlier in the day. 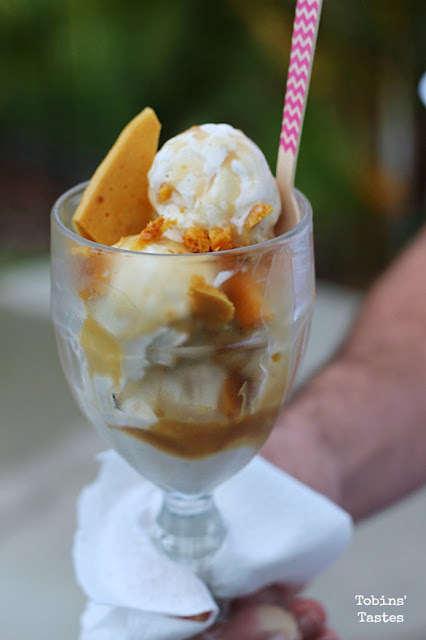 The honeycomb candy gave the sweet ice cream and caramel a molasses crunch. I have a slight fear of candy thermometers after one exploded in my favorite sauce pot so I am happy to report that neither of these recipes calls for one. The paper towels were quite handy for cleaning up the kitchen too and everyone loved how soft the regular Viva Towels were for cleaning up hands and faces as well. It was nice to just bring the rolls outside and not have to keep going back inside for napkins constantly. Turns out sticky hands and table tops weren't the only thing I needed paper towels for. We've been experiencing a ridiculous amount of rain this week thanks to Tropical Storm Colin and Viva Vantage Towels were perfect for wiping down and scrubbing our patio tables after the storm. We were able to enjoy a few hours of sunshine after dinner which was the perfect time to sit out back and make our own ice cream sundaes. 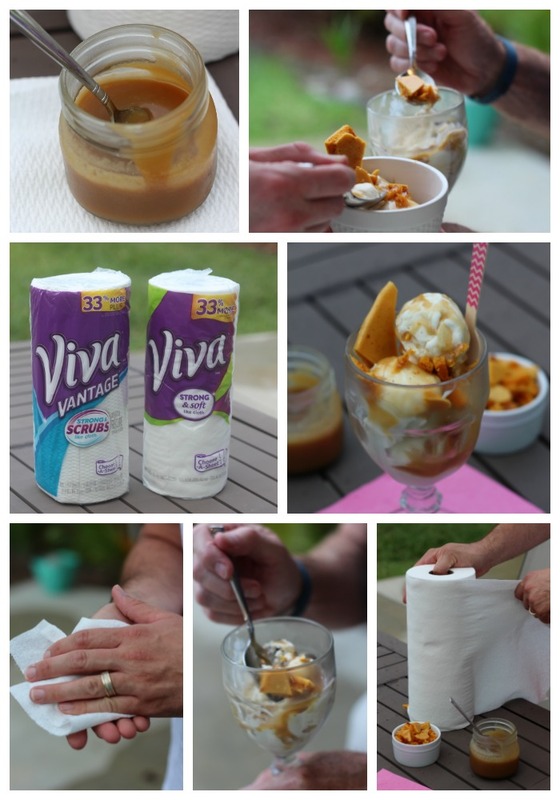 I can tell that this caramel sauce is something I will be making quite a few times this summer for backyard ice cream nights so I better stock up on Viva paper towels now because I'm sure we're going to need them. 1.) Combine the brown sugar, heavy cream, butter and salt in a sauce pan. 2.) Whisk on medium low heat for 5-7 minutes. Mixture will thicken up a little but will still be relatively watery. 3.) Add vanilla and whisk for one more minute. Remove from heat and let cool slightly. Pour in a jar and let cool in the refrigerator. Store in the refrigerator until use. 1.) In a large saucepan combine sugar, water, honey and corn syrup. 2.) Boil until mixture turns an amber color and starts to resemble caramel. 3.) Add the baking soda and stir with a wooden spoon. Mixture will foam up significantly. Take off the heat immediately and pour onto a baking sheet lined with a Silpat or parchment paper. 4.) Let cool and break into pieces. 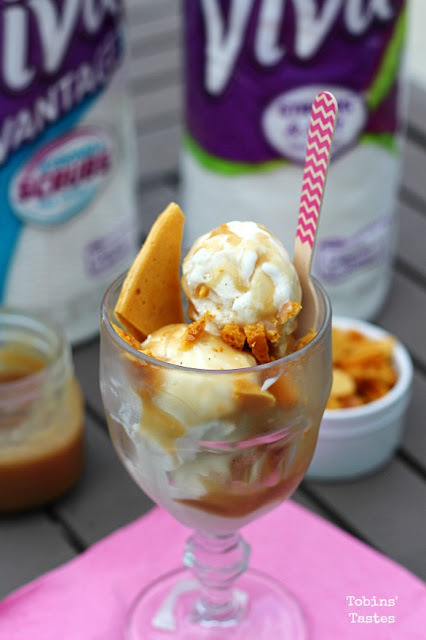 I used the smaller pieces as topping for my ice cream and caramel sauce. 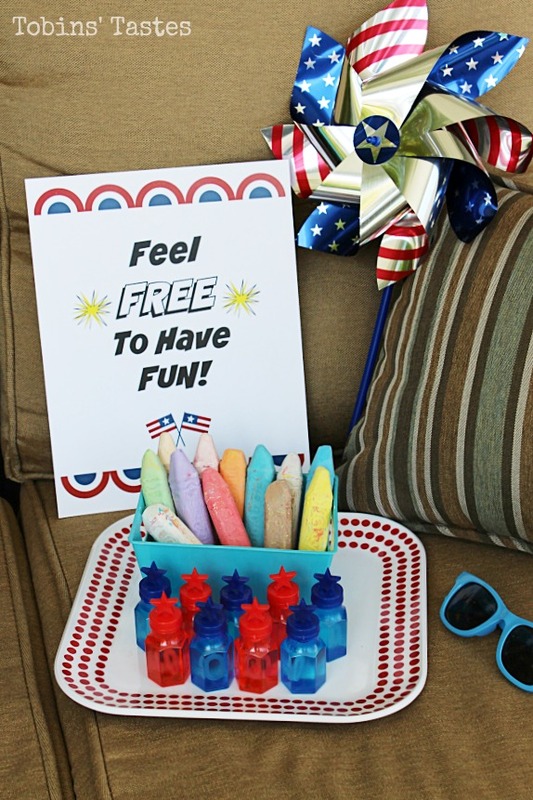 Store the candy in an air tight container to keep it fresh. 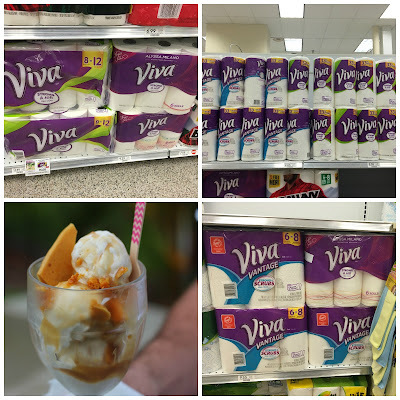 Want more ideas on how Viva Towels can help you enjoy summer time fun? Check out them out here! Would you believe me if I told you we made this dip three times in four days over Memorial Day weekend? Because we did. And the dish was scraped clean at every party we brought it too. 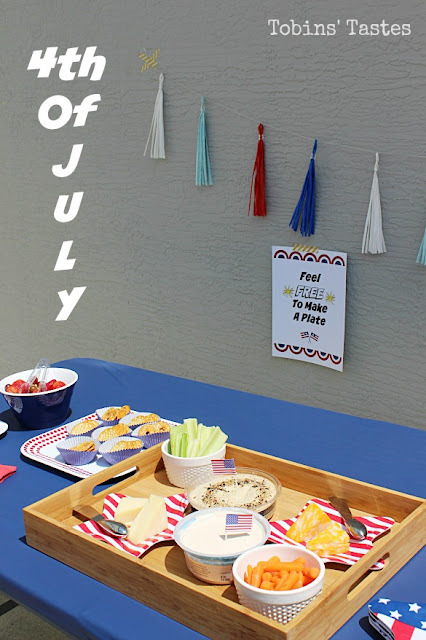 I'm a huge fan of cheese dips for parties but once temperatures start rising here in Florida, I start looking for something a little lighter to bring to holiday gatherings. 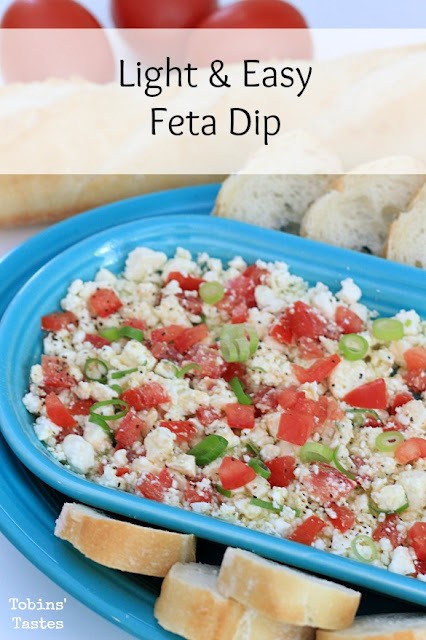 This light and easy feta dip is the perfect appetizer. Olive oil, fresh diced tomatoes, green onions, feta cheese and Greek seasoning combine to make something that feels savory and rich but is actually a lot better for you than many typical party foods. It takes minutes to put together and can be served with anything from sliced bread, pita chips, tortilla chips or even veggies. Since I knew we had a bunch of events planned over Memorial Day weekend, I went to Sam's Club and bought my ingredients in bulk. The fresh produce section in my store has an amazing selection of fresh tomatoes and buying them and the feta in bulk allowed me to save money over buying them in the grocery store. My store also has a great bakery where we were able to get the baguettes too. 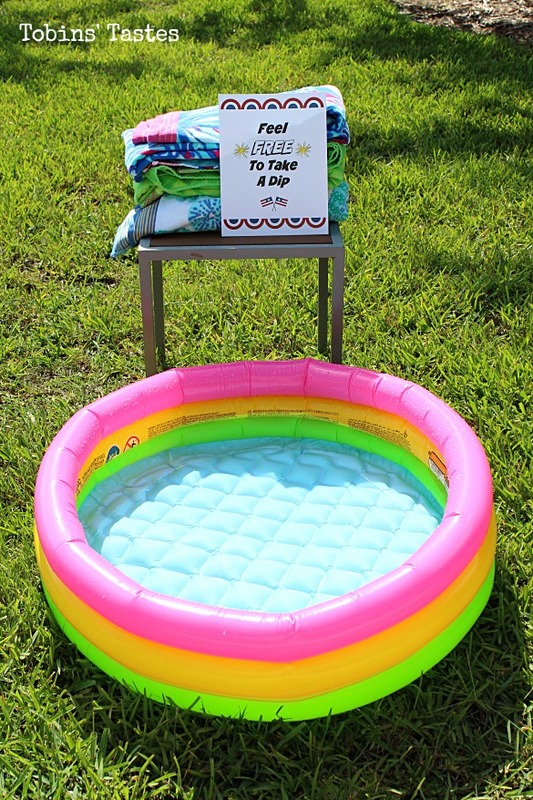 I brought this dip as pictured to a poolside BBQ on a Saturday night. Made it again with pita chips for a family beach day with friends on Sunday and then brought it to a work potluck party on Tuesday. 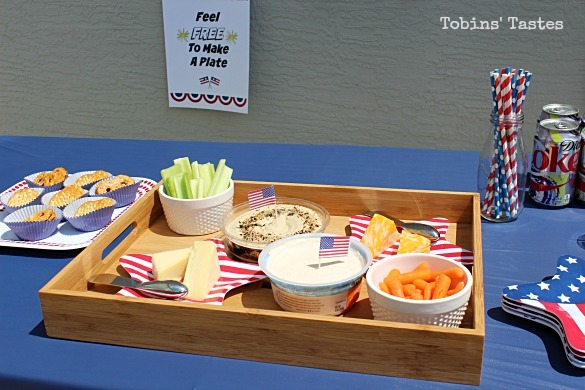 By prepping the tomatoes and green onions ahead of time, I was able to throw the dip together in minutes before each event. A lot of people think of fresh tomatoes as something that belongs in pasta dishes and salads but they are exactly what this dip needs to bring it to another level. Sam's Club digital magazine, Healthy Living Made Simple, is currently highlighting tomatoes as the super food of the month and you can check out the current issue for nutritional highlights and lots of great recipe ideas using them. This recipe is very flexible when it comes to quantities. The recipe below has general guidelines for measuring out each ingredient but you can feel free to add more or less of something as you prefer. 1.) 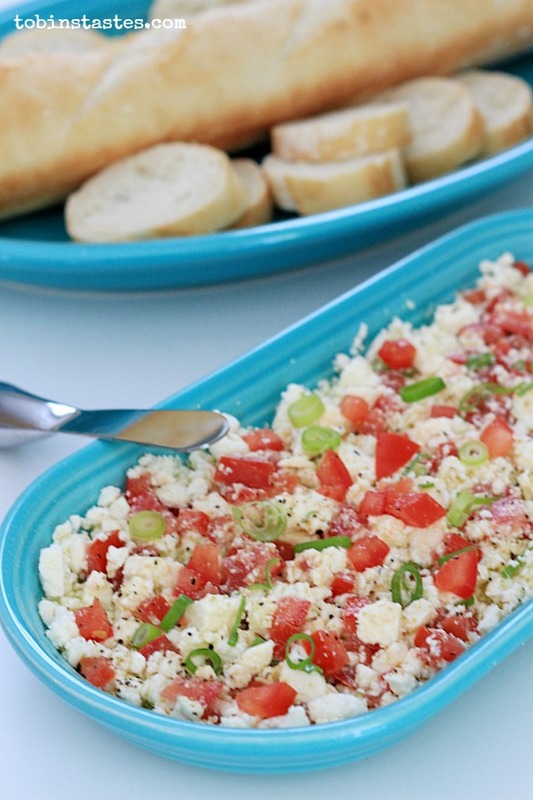 Spread out feta cheese in a shallow dish and drizzle with olive oil to completely coat the cheese. 2.) Add in diced tomatoes and green onions. Use a fork to gently mix everything together and incorporate the olive oil. Sprinkle seasoning on top of mixture and mix to combine. 3.) You may want to add more seasoning deepening on your tastes. Top with a few extra green onions for garnish. 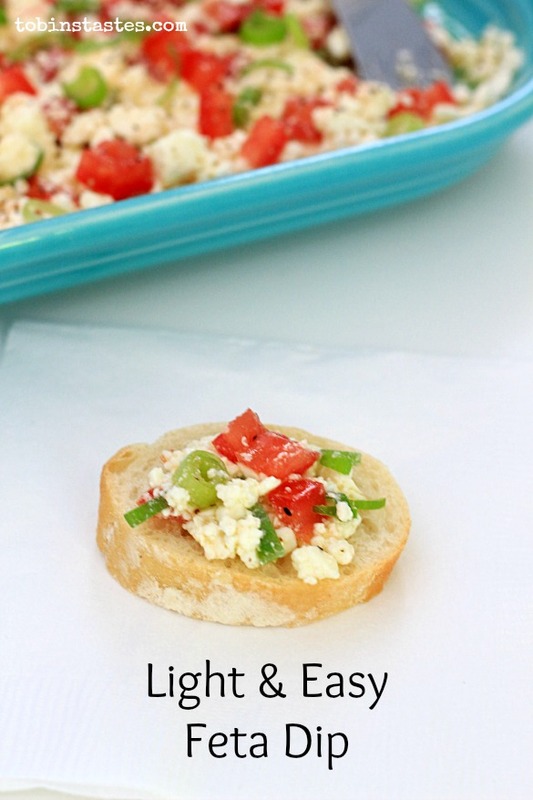 Serve with a thinly sliced baguette or pita chips for dipping. 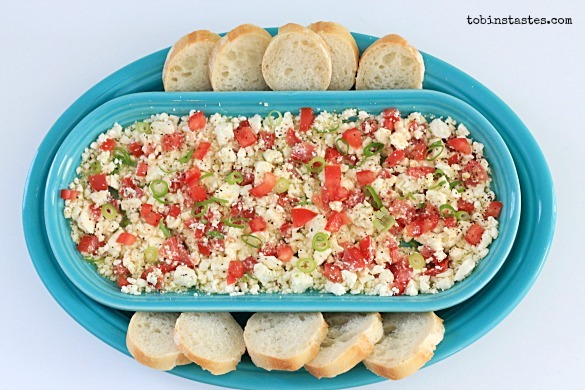 Tips: This dip can be stored in the refrigerator but it looks prettiest when made right before serving. Olive oil can get a little thick when stored in the refrigerator so it may look a little different but it still tastes great! While shopping at Sam's Club, I noticed that they are having a free hearing health screening coming up soon as well as hosting in store hearing screenings that day too. Turns out they host them every second Saturday of the month with the next one coming up on Saturday June 11th. 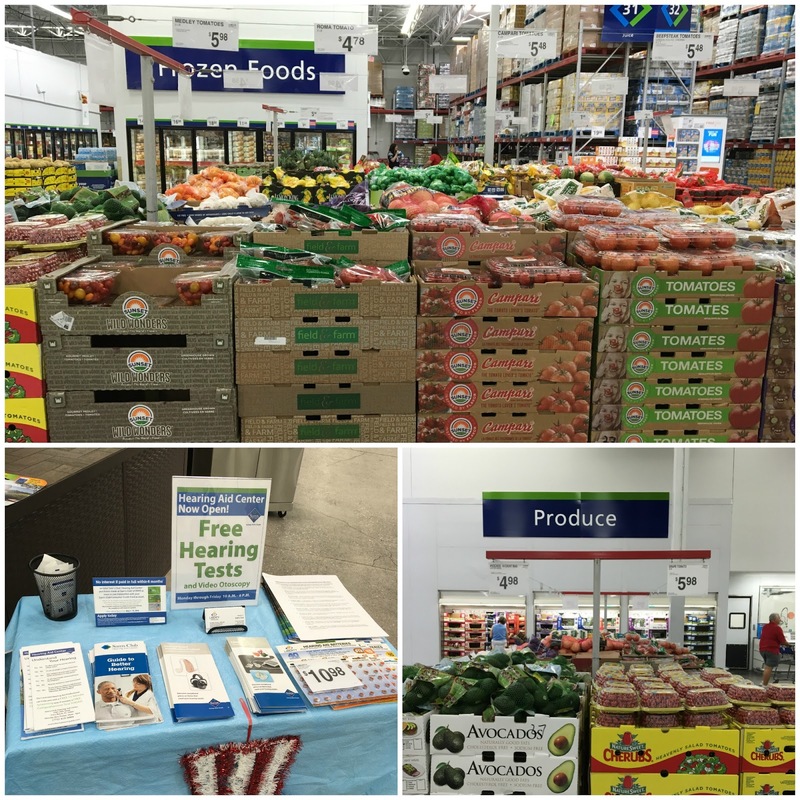 I love that Sam's Club has everything you need to help keep your family healthy summer- a great selection of food and drinks, free health screenings, an optical department and more. What is your favorite summer dish made with tomatoes?